You already know my job is fun. And sometimes I get asked to do something a bit off the grid-like test the new Thermador Steam Oven-so I went full steam ahead (ha, ha, get it?) and spent the day cooking in the showroom. The staff was groaning by the time the last food was brought to the offices. Not that it was so good-just that there was so much of it. The challenging part about this testing was that I could not prep anything, it had to be food bought “off the shelf” from one of the two local supermarkets and I couldn’t do anything ‘cheffy” to it. So buy it and go cook it-how most people feed themselves every day. 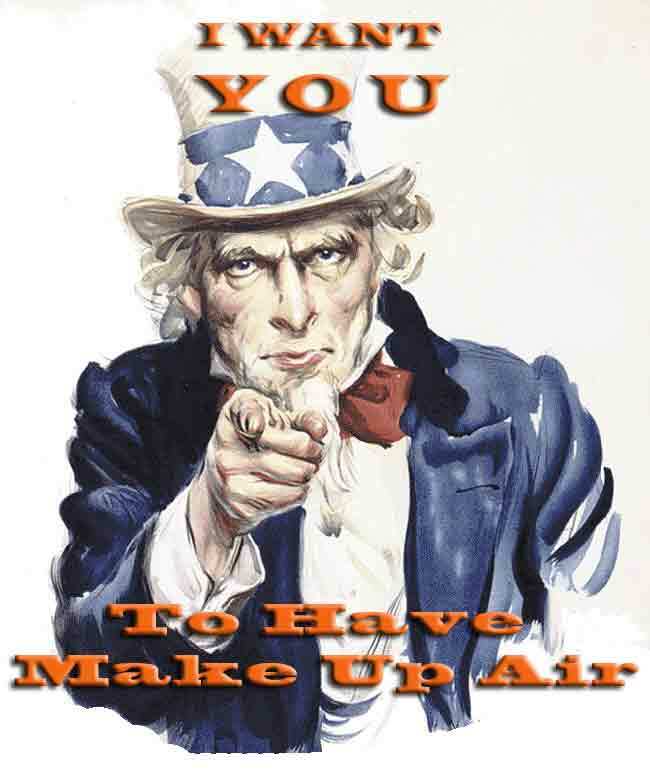 Installs into a 27″ or 30″ Cabinet. Put it above a regular wall oven, microwave, coffee system, or by itself. So with my $100 clutched in my hot little hand, this little piggy went to market. I bought fresh in-the-bag veggies, refrigerated and frozen ready to cook items and a few fresh raw products with bottled seasoning and went to work. 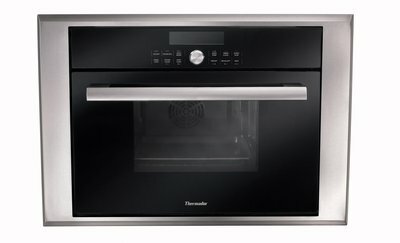 I had used steam cabinets professionally and loved the results, but they were basically the size of a refrigerator on wheels, so no go in any home kitchen I was familiar with. At home I do the ice cubes in the bottom of the oven and a spray bottle full of water thing and it works reasonably well, but I was itching to try a steam oven that fit into a 30” cabinet and was designed for home use. Many manufacturers are introducing a steam oven, so it must meet an unmet need-I was looking forward to finding out how it worked. This steam oven will cook anything a regular oven will, as it has a straight convection mode, as well as a straight steam mode and a combo steam/convection mode in addition to a few other functions. However, it is the steam function that sets this oven apart and what I was interested in. You probably know bread benefits from steam, developing a chewy crust and a soft interior with the help of the moist environment, but it also makes cooking fish fairly fool-proof (it’s forgiving in the easy-to-do dry fish department) and generally cooks beautifully without a drop of fat. For most things, you add fat, if you want, in the form of a sauce AFTER cooking, so you really are in control, especially if one person wants fat free/reduced and the other wants full fat food. A steam oven can REALLY contribute to an easy, healthy diet. 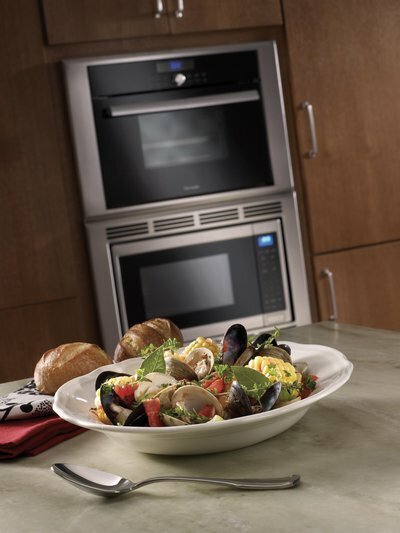 A beauty shot from Thermador showing the steam oven’s flexible install and some amazing shellfish. So basically after filling the water reservoir to feed the steam and preheating the oven, I was ready to cook. There are three levels with two pan slots each and four pans that come with the oven. There is a bit of a learning curve to use the product, but if you remember a few basic principles, it all comes clear: 1) steaming needs the pan with the holes, with the solid pan below to catch the condensation and food drips. 2) baking need the solid pan. 3) roasting needs the rack and the solid pan. Just as in boiling, dense vegetables, like carrots and potatoes will take longer than non-dense vegetables like eggplant. Steam does not cook more quickly, it is meant to cook gently, so it rocks fish in particular. I cooked scallops, meatballs, pork tenderloin, asparagus, salmon, packaged biscuits, Cinnamon Rolls, Apple Turnovers and break ‘n bake cookies and it did a fantastic job on all of them. I was particularly impressed with the frozen Goyza-cooked in 6 minutes with no sticking and no toughness. Meatballs came out juicy WITH NO ADDITIONAL FAT!! and I even poached an egg…what can I say, I was getting creative. But I was most impressed with the fish-this could really take the fear out of cooking fish for almost everyone. Healthy and easy-what more could you want? A nifty addition to the home kitchen. 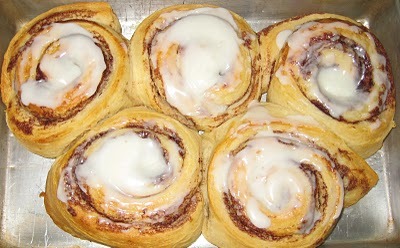 The Cinnamon Rolls turned out great and were quickly devoured by the sales staff. No, it does not do dishes. Creative entrepreneur? Get 25% off tickets to Soul Safari!